Ellen DeGeneres reclaimed her spot atop Out magazine’s Power 50 list, the publication’s ranking of the most influential LGBT voices in American culture. DeGeneres traded spots with Apple CEO Tim Cook after a year in which the comedian saw her daytime talk show ratings and popularity soar. Earlier this year, DeGeneres’ gained notoriety for “the selfie that broke Twitter” during her gig as Oscars host. “Everybody loves Ellen, and that’s one of the reasons she’s regained the top spot,” Out wrote. Lesbians had a strong showing on the magazine’s 8th annual list with MSNBC news anchor/political commentator Rachel Maddow (#3), U.S. 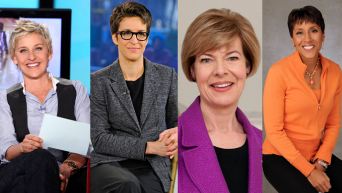 Senator Tammy Baldwin (#4) and television host Robin Roberts (#10) joining DeGeneres in the top 10. Other notables included actresses Jane Lynch (#20) and Ellen Page (#29), WNBA star Brittney Griner (#31) and television host and author Suze Orman (#35). You can view the full Power 50 list at Out magazine. Posted April 18th, 2014 & filed under News.